Fraudulent offers of legal representation, insurance coverage, and financial advice have been emailed to individuals by persons, organizations, internet sites, or social media accounts claiming to represent Sullo & Sullo. In some cases, job seekers have been asked to disclose personally identifiable information or pay a processing fee (as much as several thousand dollars) or even remit large sums of money for insurance coverage or other services. 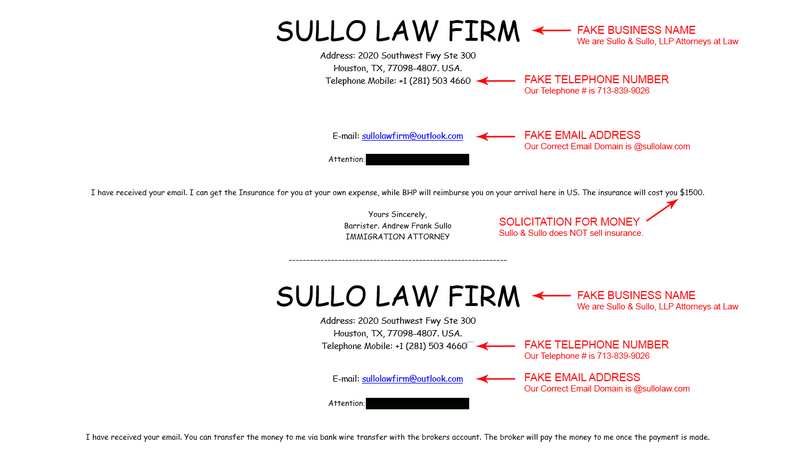 These fraudulent emails do not originate from Sullo & Sullo. They are scams designed to extort money and/or personal information. Sullo & Sullo will never request funds, require the transfer of money, or seek advancement of fees from third parties for insurance coverage, airline fees, or related expenses associated with immigration. If you receive communication that you believe is fraudulent or have suffered a personal loss from a recruitment scam, please contact your local law enforcement. DO NOT send any money or provide any personal information pursuant to an email claiming to be from Sullo & Sullo, without verifying its authenticity. Any email from Sullo & Sullo will have our website extension “@sullolaw.com”. Any call from our firm will carry our Caller ID. 1. Report any email communication requesting payment of any kind to your local law enforcement.